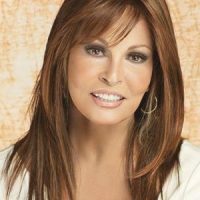 The Raquel Welch Editor’s Pick wig is an above the shoulder layered bob. It comes styled with loose, bouncy waves. 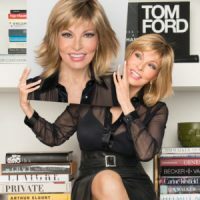 The softly waved top and bangs blend perfectly into full layers that make for a trendy, tousled look that can be finger styled or brushed into a fuller silhouette of soft waves. The temple-to-temple lace front and monofilament top offer off-the face styling and varied parting options which means styling choices are almost limitless. 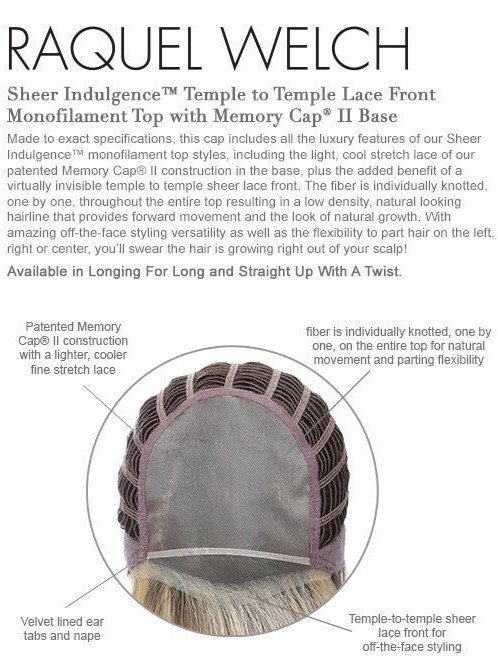 Sheer Indulgence™ Temple-to-Temple Ready-to-Wear Lace Front – Hair can be styled behind the ear and away from the face. Sheer Indulgence™ Hand-Tied Monofilament Top – Creates the look of natural hair growth and is sheer to blend in with all skin tones. Closed Crown – Adds lift and volume to the crown area. Velvet Ear Tabs and Nape – Comfort that molds to your head shape. Memory Cap II® Base – Thinner material is used to create a light, cool, and custom fit. Conforms to your head shape after 1 hour. Tru2Life® Heat-Friendly Synthetic Hair – Each hand-blended color is made up of 7-11 different shades, resulting in a natural look that blends with just about anyone’s hair color. The Tru2Life® fiber looks and feels like human hair and can be heat styled using thermal styling tools up to 350° [180°C].